Rechargables are the hearing technology you’ve been waiting for. We offer rechargeable hearing solutions to keep you connected to the people and things you love. 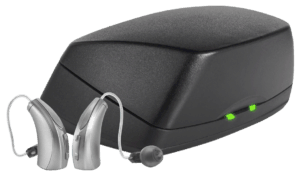 Did you know that rechargeable hearing devices can take the place of an estimated 200 disposable batteries? Now you can enjoy continuous and stable use throughout your day and avoid the hassle of disposable batteries with rechargeable hearing devices. Simply set your rechargeables on the charger overnight, instead of replacing your batteries every few days. We’ve re-imagined rechargeables. Our new best-in-class rechargeable RIC systems, are 30 percent smaller and are 100 percent easy to use. Plus, with the industry’s longest lasting charge, your hearing aids will always be ready to go. Longest lasting charge delivers over 30-hours of superior hearing.